Bryan Griffin was a pilot for Australia’s Qantas Air from 1966 to 1982. In 1979 he began to have “uncontrollable urges” to switch off the engines in mid-flight in order to bring down the airplane. He would leave the flight deck and smoke a few cigarettes until he calmed down. He made no attempt to hide his problem – he talked to his colleagues about it. Qantas had him examined and treated by several doctors, but the problems continued, including the urge to “scream and cry.” He routinely ignored instructions and repeatedly missed radio and altitude calls. On a flight from Singapore to Sydney, he felt his hand “being abused by the uncontrollable pull of the start levers” – which, if pulled, would kill the engines. OK. Not exactly “pilot of the month” stuff. There are a couple of intriguing aspects to this tale. First, Qantas made the management decision to keep Griffin on the job. While the Insider normally recommends following a “return to work/stay at work” protocol, in this case, “staying at work” for three years with severe mental illness clearly put far too many people at risk. Griffin was incapable of performing his job safely; he should have been put on indefinite leave until his mental state stabilized beyond any reasonable doubt. Griffin continued to fly until he retired in 1982 with a diagnosis of anxiety, depression and obsessive compulsive disorder. While I am no expert in the intricacies of comp as it operates down under, I am confused by this award. How can you suffer a “loss of earnings” when you continue to work? 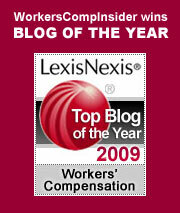 How does workers comp indemnity come to play in a situation where there was no lost time? Perhaps the commission assumes that if Griffin had been grounded during his prolonged period of mental disability, he eventually would have been cured and then would have been to continue his career with Qantas beyond 1982. In other words, Griffin’s premature retirement was caused by making him work while he was suicidal. If that is the reasoning, it’s a bit of a stretch. I have one additional question for the commission: why did it take nearly 30 years to reach this conclusion? Qantas is considering an appeal on this ruling. I think they should shut up and cut the check. Any additional proceedings might further expose their amazingly reckless decision to keep Griffin in the cockpit. That is negligent entrustment at its very worst. Ironically, had Griffin succumbed to his demons and crashed the plane, we might never have known the real cause of the accident. As it is, Qantas is lucky that both Griffin and his hundreds of passengers survived. Air travel is stressful enough without having to worry about a pilot with a barely controllable urge to crash the plane. This entry was posted on Friday, March 26th, 2010 at 11:06 am	and is filed under Best Practices, Business, Disability, Safety & Health. You can follow any responses to this entry through the RSS 2.0 feed. Both comments and pings are currently closed.